Prolimatech has unveiled a monstrous CPU cooler which makes use of a Quad heatsink design aimed for X79 LGA2011 platform. The cooler features four heatsinks with dense aluminum fins stacked on each sides bearing a design similar to the Prolimatech Genesis heatsinks. 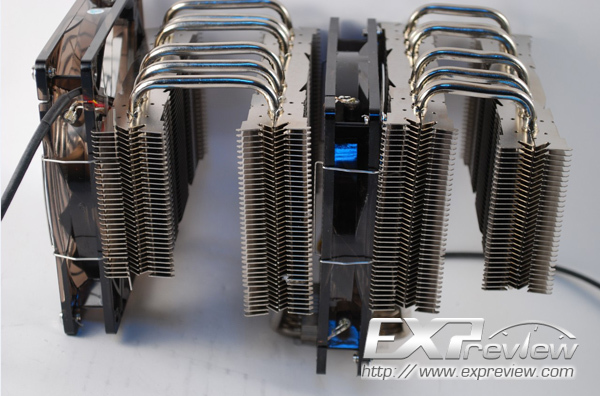 Its like prolimatech took four of those heatsinks out and stacked them together to form a mammoth cooler. 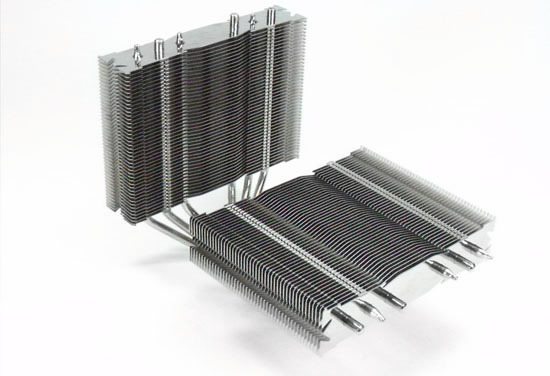 Each side of the heatsink are equipped with five U-Shaped heatpipes which are directly connected to the base plate on the cooler. Each side has an empty space under its curved heatpipe design ensuring enough space for memory modules as we know that X79 motherboards have 2-4 DIMM slots on each side of the LGA 2011 socket. The cooler can accomodate upto three 120-140mm fans, Release date and price are unknown.